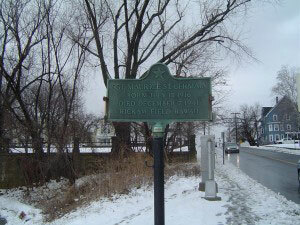 Photograph of Maurice J. St. Germain’s recognition plaque, located in Manchester NH at the south side of Amory Street opposite Coolidge Avenue. Copyright of Martin Miccio for the City of Manchester, and used here with permission. The City of Manchester’s Board of Alderman passed several ordinances on 16 December 1947, signed by Mayor Joseph T. Benoit. One stated as follows: “That the square located where Amory Street, North Main Street, and Coolidge Avenue intersects be officially designated and hereinafter known on all official records…as ‘Maurice J. St. Germain Square.’” The bronze plaque reads: “SGT. MAURICE ST. GERMAIN. BORN JULY 15, 1916. DIED DECEMBER 7, 1941. HICKAM FIELD HAWAII. Maurice J. St. Germain was born on 15 July 1916 in Manchester, Hillsborough County, New Hampshire. His parents were Canadian immigrants–Valerien & Azilda (Provencher) St. Germain. Maurice attended local schools–including West High School. 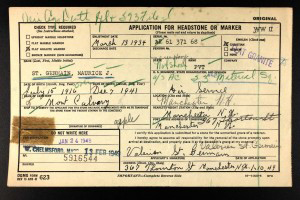 According to the application his father filled out for a headstone, Maurice enlisted in the Army on 13 March 1934, at the tender age of 18. On May 7, 1940 when the United States Census was taken, then 24-year-old Pvt. Maurice St. Germain was stationed at the U.S. Army’s Fort Slocum in New Rochelle NY. [now closed and dismantled] By December 1941 he had been assigned to the 23rd Material Squadron, Headquarters and Headquarters Squadron, 17th Air Base Group, Hickam Field, Oahu, Hawaii. Most people remember the “Day of Infamy, 7 December 1941, as the day that Pearl Harbor was attacked by Japanese bombers. Few realize that other installations on the Hawaiian island of Oahu were also devastated, including that of Hickam Field. It was “Hell in Paradise.” The attack came in two waves. The third group of the first attack wave consisted of Mitsubishi A6M ZEKE fighters.Their target was the aircraft at Ford Island, Hickam Field, Wheeler Field, Barber’s Point, Kaneohe. The first group of the second attack wave consisted of B5N bombers. Half of them attacked the aircraft and hangars on Kaneohe, Ford Island, and Barbers Point while the other half attacked the aircraft and hangars on Hickam Field. Pockmarks and shell holes are visible today, after all these years, from the heavy damage to the neatly lined up aircraft, the hangars and the barracks. By the time the wave of carnage was over at Hickam Field, nearly 200 were dead and the majority of aircraft damaged or destroyed. Among the casualties was Pvt. Maurice J. St. Germain. He was awarded the purple heart posthumously. His remains were not able to be sent home until after the hostilities ended. Maurice finally was laid to rest 23 Dec 1948 at Mt. Calvary Cemetery. In January of 1949 Maurice’s father requested an official military marker, which was sent and installed in Mount Calvary Cemetery.